Ireland is Inexpensive, Isn't It? Recently, I received an Email from an erstwhile American living in Maryland who is determined to move to Ireland with her Irish husband. As part of her Email, she stated that it was her understanding that Ireland is a relatively cheap place to live. Her exact comment was: "But I hear I don't need as much money to live well." Ummm - unfortunately, that's just not true at all. 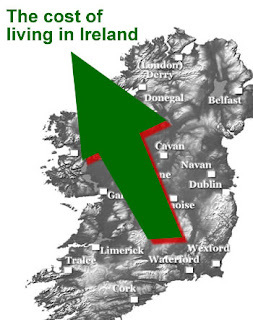 For a whole lot of reasons, Ireland can be a very expensive place to live. So, let me share what I wrote back to her. * During that time period, we became one of the wealthiest countries in theEuropean Union. Per capita income was flying! * But the downside was a significant increase in the cost of living. As of 2007 (and the latest figures available), Ireland became the most expensive country to live in the EU. We outpaced even Finland for that dubious honour. * Everything - well not quite everything - rocketed in price: housing (we had a vicious housing bubble), groceries, petrol, you name it became more and more expensive. * The 'good news' is that - because everyone was spending money - there was finally a bit of competition over here. So certain things - white goods, TVsets, etc - came down a bit in price. Compared to 1982 when I moved here, many of these items are less expensive now. * In a previous Email, you mentioned that your Hubby was from the North. Areyou planning to live up there? The cost of living is less in the North than in the Republic. If, however, you're living in the Republic and being paid in Euro, many Irish people are going across the border to shop. This is due not only to the relatively low cost of many items, but also due to the current weakness of the Pound Sterling compared to the Euro - our euro's go just that much further right now in Northern Ireland. * The other bit of good news is that the housing bubble has burst: right now, buying a house here is much less expensive than it used to be - by about a third, depending on the type of house and its location. And, because of the current recession, the cost of many items is falling drastically: from clothing to food to cars, things are becoming less expensive here. * And this will continue for one simple reason: the government - only yesterday - announced a so-called 'Mini-Budget'. This had the effect of increasing taxes on almost everybody's salary by about (and on average) 4 percent. So that's more money that's being taken away from us (and out of the economy), which will force prices down even more, as retailers and manufacturers struggle to encourage people to buy. Hopefully, the book (A Survivor's Guide to Living in Ireland) will give you a few tips on what to bring and what not to bring. But the important thing is this (and in reference to your thoughts on how 'cheap' it is to live here): Ireland is NOT inexpensive. While it is not as expensive as London or certain cities in the US (Washington DC, LA, and NY come to mind), Ireland is expensive. And that, I'm afraid, is just the way it is. But if you shop around, and learn to 'shop like the Irish do', you should do okay here (assuming you can find that elusive job.) Good luck! All the services and products are easily available everywhere these days. Technology is causing all the things to be available on the internet as well allowing the people to buy the products and services over the internet over the internet sitting at home.